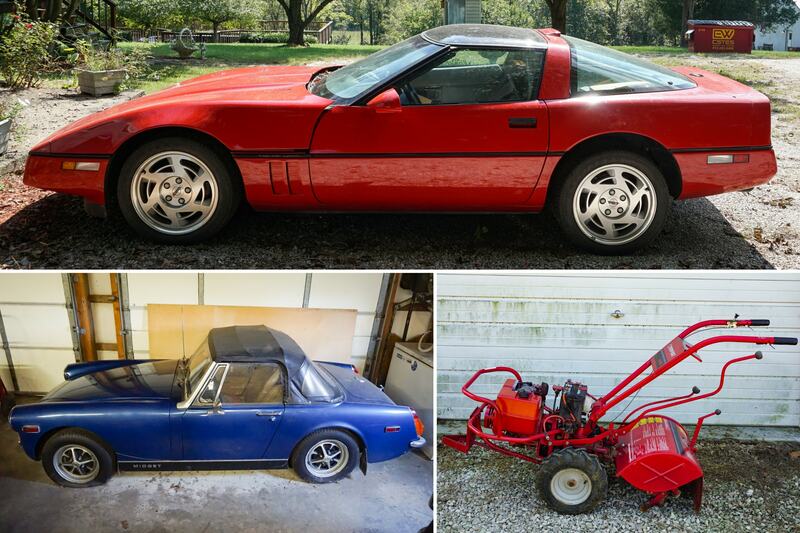 Timothy Davis Estate Auction — Harritt Group, Inc.
7% Indiana sales tax collected on all titled vehicles. Cash, check or wire transfer. Wire transfer requires $1,000 down day of auction, balance due no later than Monday, October 15, 2018. Possession and title held for 14 days with payment by check for bank clearance. Selling live on site the personal property of the late Tim Davis. Highlights include a Corvette, barn found MG Midget, Donzi GT-250 boat, trailers, tools, equipment, bar & restaurant equipment, household, collectibles and more. Auction located just 1 mile West of IN-135 in Corydon or 3.4 miles South of St. Rd. 64 in Georgetown. 2007 Yamaha V-Star 650 Classic, 9,445 miles, leather saddle bags, VIN # JYAVM01E57A117030. 1990 Donzi GT-250 cuddy cabin boat, OMC outboard engine (has been stored several years) with 1994 EZ-Loader trailer with recently replaced tires. 2007 Interstate 5’x8′ enclosed single axle utility trailer, VIN # 4RACS08117K019754 and flatbed tandem utility trailer (no title). Troy-Bilt 4 hp Trailblazer walk-behind sickle bar field mower, Troy-Bilt Horse rear tine rototiller, Troy Bilt 3-in-1 self propelled push lawn mower, Husqvarna 125BT backpack blower, Echo PB-260L backpack blower, Billy Goat SP170 push blower, straight shaft 123-LDX Husqvarna weed trimmer, ECHO HC-1500 gas powered hedge trimmer, Husqvarna chainsaw, ECHO chainsaw, Husky pressure washer, electric pressure washer,Toro push mower, Scotts push mower, Toro Power Curve 1800 electric snow blower, concrete mixer, light up directional sign, scaffolding equipment, tractor implements, pull behind lawn cart, tree dolly, Jobox worksite tool box, disassembled carport, lawn sweeper, Ryobi 10” table saw, Delta planer, JET Dust Collector serial number 10086511, Shoprider electric scooter, Ready Heater Pro 200 torpedo heater, DeWalt heavy duty planner, 11-gallon air compressor, Worx electric yard vacuum, planner, retractable 25’ hose reel, 2-ton compact floor jack, industrial fans, industrial work lights, Craftsman rolling tool chest, large selection of Craftsman hand tools including socket sets, wrenches, screwdrivers and more, air tools, clamps, vise grips, car batteries, bench grinder, large industrial vise, industrial tool bench, Clarke sandblaster, portable air tank, Hydro-Flo parts washer, industrial lime green parts organizer, several metal tool boxes, Ryobi drill press, folding aluminum ladder, True Temper wheelbarrow, electric sander, large selection of power tools in original cases, tree stand and bow, stuffed deer mounts, dollies and remaining contents of pole barn garage. Selling restaurant equipment and decor of the Carefree Old Stone Lodge and Grill in Leavenworth, IN including (2) Industrial stainless steel meat slicers, stainless steel restaurant equipment, Hobart commercial grade mixer, large selection of modern beer advertisements including a neon Miller Lite sign, Leinenkugel’s & Budweiser signs, Busch Light mirror, Coors Light Nascar hood, Corona clock, bar stools and chairs, open signs, pizza signs, nacho cheese dispenser, bun warmer, large selection of glasses, cups, plates and more. Retro mantle radio, men’s bicycle, electric heaters, large selection of glassware, home decor, linens, kitchenware, custom made corn hole boards and many more items too numerous to mention. I-64 to Corydon Exit #105. North 2.5 miles on IN-135 to right on IN-335. 1 mile to auction on right. OR 3.4 miles South of St. Rd. 64 just West of Georgetown.